In the movie Willy Wonka and the Chocolate Factory, golden chocolate eggs are placed on an eggdicator scale to determine if they’re good or bad. Good eggs are shipped out. Bad eggs go down the garbage chute into the incinerator. Even spoilt child Veruca Salt is sent down the garbage chute. When it comes to separating good green or roasted beans from bad, the same theory applies using Satake’s range of optical sorters. Sid Jain, Satake Australia’s Optical Sorting Sales Engineer, says having a clean bean is the difference between a good flavour in the cup and an excellent one. “Coffee is all about taste. The flavour of coffee is so important. One bad element in a coffee can affect the entire taste profile,” he says. Without a final clean, no hessian bag of beans arrives at a roaster free of impurities. Sid says what he’s found in bags over the years is quite alarming. 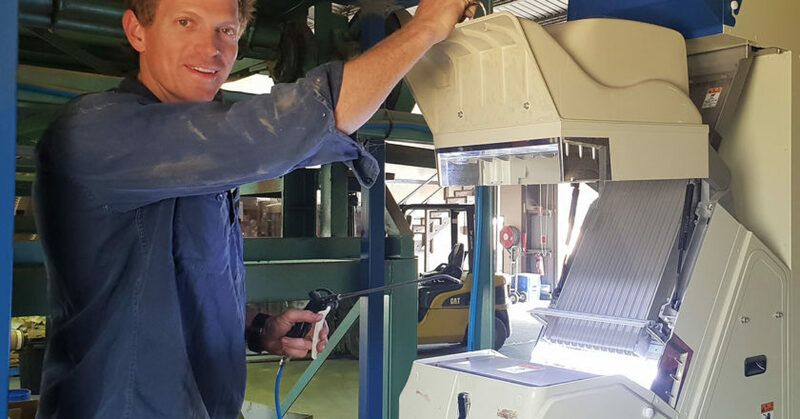 “Using the optical sorter, I’ve seen the machine remove stones, sticks, rocks, glass, plastics, as well as beans that have insect damage, insect larva, are immature or moulded, discoloured, or deformed,” he says. To avoid these, Satake’s optical sorter FMS2000-F is used to detect the most harmful of objects not seen by the naked eye, but large enough to do damage. Green beans are fed into the top of the Satake sorting machine. Once activated, the beans run along a vibratory feeder at a desired flow rate between one to 1500 kilograms per hour. A full colour charge-coupled device camera inside the sorter captures 12,000 frames per second and detects defects or marks on coffee as small as 0.14 millimetres in size, about the size of a pencil tip. Strong air pressure is used to separate and spit out rejected beans or foreign objects in a separate chute to the accepted beans. Green bean samples fed into the Stake FMS-2000 (left), compared to rejected beans and accepted beans. Satake developed the first two-colour sorting machine for green coffee beans in Colombia in 1947 and in South Africa in 1952. The Pikasen Alpha FMS-2000 full colour sorter made its debut in the market in 2014 and enhanced Japanese-made models have been manufactured since. The high capacity range of Satake optical sorters can clean through 27,000 kilograms of roasted or green beans per hour. To date, Sid says more than 13,000 FMS2000-F optical sorters around the world are used for different applications. Satake is now a leading company in grain processing systems with business in more than 150 countries. Its product range includes rice and flour milling machinery, biomass gasification systems, microbial analysers for ballast water, and packaged rice for the food industry. With a strong customer base in Taiwan, America, Thailand, and Australia, Sid says the increased uptake of optical sorters is an indication of consuming countries taking extra care of the product they present to the end user. In Australia, large-scale coffee roasters use the optical sorter to sift through green beans on arrival to the warehouse, while coffee farmers use the device to clean their produce before shipping it out. One such user is Mark MacLaughlin, Plants Health and Breeding Manager at Skybury Coffee Plantation in Queensland. Before installing a Satake optical sorter about two years ago, up to eight staff members at Skybury would hand sort the coffee to eliminate any impurities – a very labour-intensive, expensive, and time-consuming task. “We’ve come from a history where having colour sorters was a huge technical headache. But as our volume of production increased and the demand on our staff became greater, we revisited the idea,” Mark says. Mark worked with Sid to program the machine and set it up for three different settings to suit Skybury’s volume of product and level of grading. “Once we had ordered one, the other growers in the area heard about it and bought one too,” Mark says. Mark runs the machine at 1000 miles an hour doing one to 1.5 tonnes of beans per hour – “just to give the machine more time to think” – but it can excel to four to five tonnes of beans per hour, grading the coffee for mottle defects and colour imperfections. At Skybury, Mark grows red and yellow Catuai, in addition to the farm’s oldest crop cultivar – Bourbon. It grows among red papaya crops which give it shade. “We’ve come from doing 100-plus tonnes a year back down to 25 tonnes of coffee per year, but we are looking to get back to 60 tonnes. There is strong demand for our coffee from brokers in Germany, as well as direct to clients in Spain, the UK, and Japan,” Mark says. 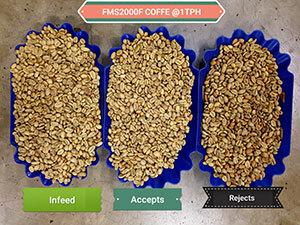 Satake’s FMS-2000 model made its debut to Australian audiences at the 2017 Melbourne International Coffee Expo. Seven machines were sold after the show, mostly to coffee producers in the north of Australia, as well as roasters in Sydney. This article appears in the October edition of BeanScene. To read the story in FULL, subscribe now.